The staff were friendly, helpful and the room was cheaply priced. I had a good nights sleep and was very happy with my stay. I would stay again. When would you like to stay at YHA York? A city packed with history and culture, York is a perfect city break destination for visitors to enjoy all year round. Just a 15 minute riverside walk from the city centre, YHA York is a friendly hub for a city that lives and breathes history. From boutique shopping on cobbled streets, to the most attractions per square mile in the UK, York's thriving culture makes it a must-see location. Don't miss a trip to the JORVIK Centre or a walk through the Shambles - one of Europe’s best-preserved medieval streets. The hostel has 203 beds across 45 rooms. 32 of these are en–suite rooms. After a multi-million pound makeover in 2013, the hostel has everything you need for a comfortable stay in modern surroundings. We might be rocking Viking shields in our courtyard, but you'll find 21st century Wi-Fi, high tech equipment and food around the clock in our stylish restaurant. Why not treat yourself to a tasty special, some local Black Sheep ale or cheeky tub of ice cream from the Ben & Jerry's machine? There is a private dining room available, three dedicated conference/education rooms with full AV equipment, a 24 hour café bar, games room with a pool table and IT suite with WIFI. There is a laid back, relaxed ambience in the bar with tables, stools and easy seating available. Plug in your laptop or order a delicious meal from our menu to make the most of it. We also have a self-catering kitchen, bike store, car and coach parking. 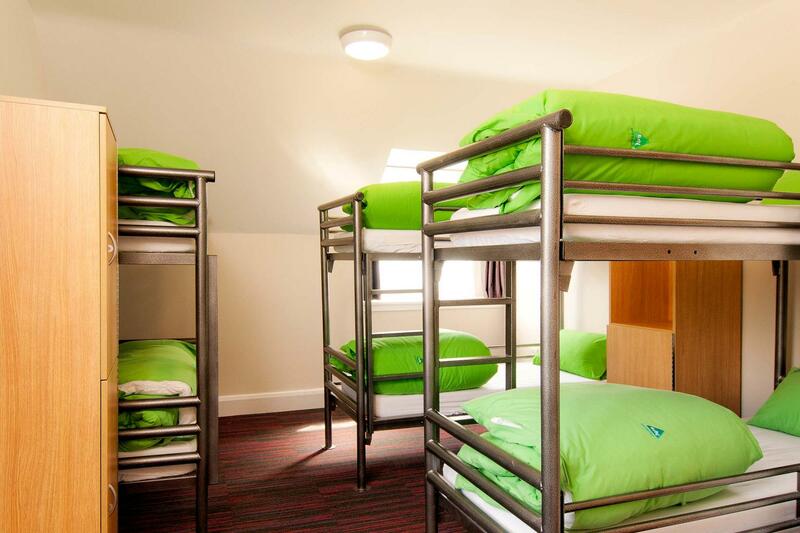 YHA York is a very busy family friendly hostel, and is often full, so do book early. Our Café & Bar provides a contemporary, relaxed and cosy atmosphere away from the bustle of this historic city. Offering a broad selection of delicious food, alongside a range of freshly made hot drinks and a well-stocked bar. Open daily to guests and passers-by, let us welcome you to rest your legs and indulge your senses after the day’s sightseeing. A leading museum of everyday life. Discover how people lived through household objects and recreated rooms, shops and even prison cells. See the Museum website for more details. Parking: Free parking for both cars and coaches available on site. The combination of on-site activities, spacious grounds, a handful of activity rooms and easy access to local world-class attractions makes YHA York an enviable base from which to build educational visits around the city and wider county. The hostel is able to accommodate up to 203 people, has classroom facilities and is able to provide meals. At YHA York we have three meeting rooms available for hire - the Harris Room, the Seebohm Room and the Rowntree Room. Capacity: Up to 60 delegates each in the Harris Room and Main Conference Room, and up to 20 in the Rowntree room, depending on seating configuration. Accessibility: The Rowntree Room located on the ground floor and has step-free access. The closest accessible WC is just off the reception lobby. The Harris Room is also on the ground floor and has step-free access via a ramp; however, the doorway is narrow. The Seebohm Room is located on the 1st floor and can only be accessed by stairs. For more information please see our access statement. We are very grateful for all of the help and support that our generous volunteers give to YHA. We are proud of our “Investors in Volunteering” accreditation and have a wide range of opportunities available across the country, all of which will provide great learning or social experiences and help us to create even more opportunities for young people. Volunteering is a great way to meet people, visit new places, gain experiences and have fun. Full details of all of our various volunteering programmes can be found on theVolunteering website. Please contact [email protected] or call 01629 592562 for more information. Read our hostel's stylish murals to learn about more about York-based confectioners Rowntree's and see how their advertising evolved with the times. York itself is packed with attractions celebrating every era and history buffs will find it difficult to leave. Whether you want to walk on a genuine Roman floor or meet the sea monsters of prehistory, the Yorkshire Museum makes a great start to your journey. Or you can come face to face with 2000 years of villainy at the York Dungeon - a theatrical walkthrough of York's blood-thirsty history, minus any boring bits!